July | 2012 | Beer Apprentice - Craft Beer News, Reviews, Interviews and Info. Hello everyone. For today’s craft beer review I’m going to be trying the 2008 production of the Fullers Limited Edition Vintage Ale brewed by Fuller Smith & Turner PLC Brewery located in London, England. I’ve been fortunate enough to have the opportunity to try several of these in the past and all have been very good. I’m really excited about trying this one as well. From the website, fullers.co.uk, we find this enticing description of these brews. I have, in my possession, bottle number 118,317 of 145,000. This beer comes in a 16.9 oz. bottle and it has an ABV of 8.5%. It poured a murky, burgundy/brown color with a nicely sized, off white head. It was semi-creamy and soft. It had a decent retention time and it left behind some adequate lacing as well. A slight appearance of some alcohol legs were left on the glass when tilted too. The aroma presented a solid dose of caramel and toffee sweetness. Hints of cranberry, ripe apple and raisins. Very yeasty also. As it warmed, it kind of smelled like freshly baked raisin bread with brown sugar sprinkled on top. Nice. The taste burst through with that sugary caramel malt sweetness. Savors of doughy bread and yeast mixed with raisins and dates. A minor taste of alcohol, but it quickly dissipated after a few sips. I found it to be well balanced, harmonized and suitable. Not too strong either. Just about right. The mouthfeel was medium bodied. Dry, chewy, and incredibly smooth. The carbonation was low to medium/low. No discernible warmth was felt, however a decent amount of flavor was left behind after each taste. Well, this brew is very good in my opinion. Actually, all of these Vintage Ales are very good. They are super easy to drink, have plenty of flavor and age gracefully. I’d highly recommend trying some if you have the opportunity. I’m very happy to be able to obtain these with relative ease. I try to pick one up every so often to put back for a rainy day. I think they are very underrated and should be treated with the utmost respect by even the most advanced craft beer aficionado. 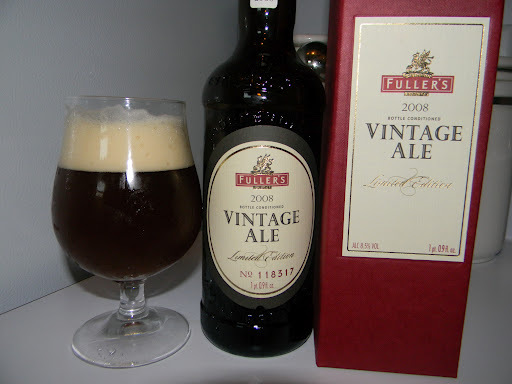 Even though this version didn’t seem to be as complex as some of the others I’ve tried I would still say give the Fullers 2008 Limited Edition Vintage Ale a try and see what you think. Hello everyone. For today’s craft beer review I’m going to be trying another J.W. Lees Harvest Ale produced by the J.W. Lees & Co. Ltd. Brewery (Greengate Brewery) in Middleton Junction, Manchester, United Kingdom. This particular brew is a 2006 version aged in Sherry Casks. Let’s revisit the website, jwlees.co.uk, for the commercial description of these tasty brews. Released in limited quantities in December, Harvest Ale gives a rich, strong flavour, beloved by beer connoisseurs. It can be laid down like a vintage wine for enjoying in later years. I don’t know about you, but I’m ready for a sip. This brew, like all other J.W. Lees Harvest Ales, comes in a 9.3 oz. bottle with an ABV of 11.5%. It poured a surprisingly clear, brown caramel color. It formed a very, very small off white head. Literally, no size at all from a most gentle pour. A thin circumference of foam was left around the top of the liquid, but no lacing was to be found. A prevalent film of clear alcohol was left on the sides of the snifter when tilted however. The aroma was incredible!!! Beautiful, robust, rich tones of wood and oak along with a very well blended and balanced sherry note. Further hints of sweet caramel sugars with undertones of toasted wheat bread. The sherry pulled the most subtle wine aroma through while tender hints of dark fruit (fig mostly) add even more intricacy. An awesome bouquet to say the least. Within the taste I found some sweet caramel sugars and more of the nice, round wood and oak. Savors of deep, dark breads soaked in wine, but without the sharp sourness that accompanies some wines. Dark fruity fig and raisins complete this well balanced, harmonized and complex brew. The mouthfeel was medium bodied. Dry, very smooth and kind of chewy with a very low carbonation. A soothing warmth was felt at the back end as it slipped down into the belly. A very good deal of flavor was left behind long after each sip. Well, this is another outstanding beer by J.W. Lees. I know I’ve mentioned this before, but if you love big, malty Barleywines you need to try a few of the Harvest Ales no matter the vintage. They are all top of the line products in my opinion. They are chocked full of flavor and aroma. Not to mention that each have varying subtleties that arise with age and from the different barrels from which they are matured. They are geared more as a slow sipper during the cooler months, however one could also imbibe gently during warmer weather as well. If you guys happen to have the opportunity to try, or if you have already tried, the J.W. 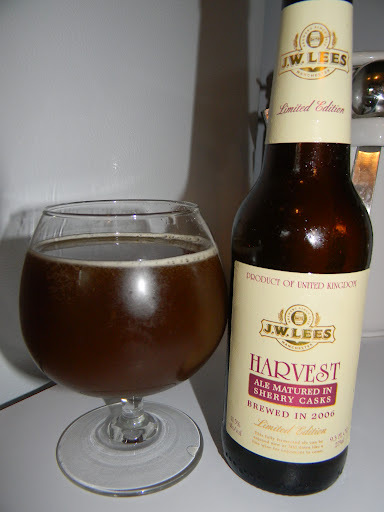 Lees Limited Edition 2006 Harvest Ale (Sherry Casks) let me know what you thought of it. I would be interested in your opinions. Hello everyone. For today’s craft beer review I’m going to be trying the Vicious Hibiscus produced by the Michigan Brewing Company located in Webberville, Michigan. Rumor has it that this brewery is no longer in operation. I honestly have no idea if that is accurate or not, so maybe someone could comment and let me know of their status. One thing is for sure, I couldn’t find a website for them, so I had to revert to ratebeer.com for the commercial description of this brew. BRACE YOURSELF…you are in for some ferocious refreshment. Grapefruit, strawberries, raspberries and malt in the taste, but subtle. This is the good stuff: suggestive, complex, deep. Tackle a frothy pint of Vicious Hibiscus now while you have the chance. Only the adventurous taste the glory. Ok. Let’s give it a try. This beer came in a 12 oz. bottle and it had an ABV of 5.5%. It poured a beautifully clear, rose color with an off white head that had a noticeable pink tint to it. It was very nicely sized, soft, frothy and soapy. The retention time was great and it left behind some excellent lacing. It was quite unique and appealing looking I thought. The nose was nice and fruity. Very floral too. Mostly all I received were hints of strawberry as far as the fruitiness goes. It also produced similarities to a “Wit/Wheat” beer with tones of yeast and spice. Overall, a bit simple and tame, but rather well balanced and pleasing. The taste was very similar to the aroma. Light and fruity tinges of strawberry. Again, floral tasting (if that can even be tasted). Coriander seemed to be the spice that was most noticeable to me. I found the flavor to be somewhat bready and yeasty as well. Likewise to the fragrance, the taste was very calm and serene, but well harmonized and balanced. The mouthfeel was medium to mostly thin bodied. Very light, airy, crisp and refreshing. Just a touch watery also. The carbonation was nice and lively, although not a whole lot of flavor was left behind on the palate after each sip. Well, one thing is for sure. This beer was super easy to drink. I was taking huge gulps of this thing. It would definitely be perfect for the Summertime heat. Overall, it wasn’t very strong or pronounced, but that’s ok. I enjoyed it nonetheless and think that I could have several bottles of this and be totally happy about it. It’s a bit off-the-wall with it’s strawberry and floral/yeasty components, but it was nothing so deranged that wouldn’t warrant a glass if you were able to obtain it. 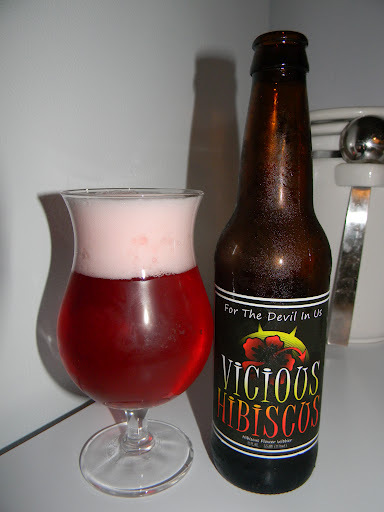 Have you guys ever tried the Michigan Brewing Company Vicious Hibiscus? What did you think? Feel free to leave a comment and tell me your opinion. Posted by Beer Apprentice on July 26, 2012 in Country: USA, Michigan Brewing Co.